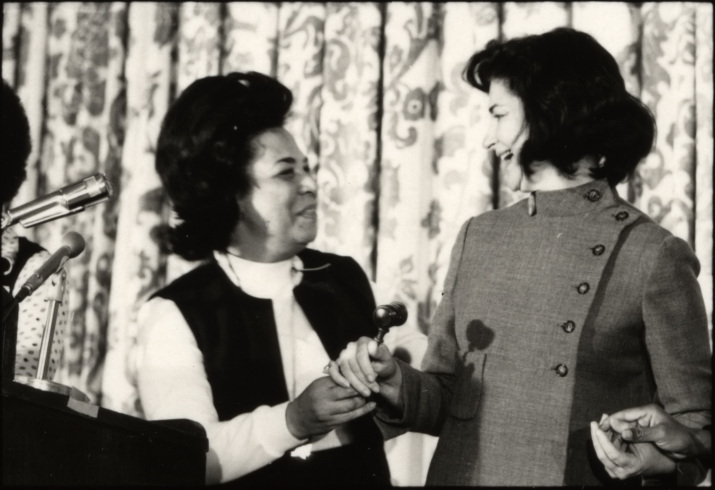 Gwen Cherry presents Frances “Sissy” Farenthold with the gavel of the National Women’s Political caucus after Farenthold’s election as the Caucus’s first chairwoman. After Congress failed to pass the federal Equal Rights Amendment in 1970, the founding members of the National Women’s Political Caucus concluded that equality would come only with women’s representation in political office. At the time, women represented just 1 percent of elected officials nationwide. Three hundred and twenty women from 26 states met in Washington, D.C., on July 10-11, 1971, to launch the Caucus. Participants came from diverse racial, political and economic backgrounds. There were Republicans and Democrats, activists and political appointees. And there were famous women, too, including Gloria Steinem, Bella Abzug, Betty Friedan, and Myrlie B. Evers, wife of slain Mississippi civil rights leader Medgar Evers. In February 1973, less than a year after her vice-presidential nomination, Farenthold was elected the first chair of the National Women’s Political Caucus at the group’s biennial convention in Houston. She had been urged on by Steinem and others, and had accepted the two-year term as chair, despite the misgivings of her supporters in Texas, who were worried that her affiliation with the Caucus would alienate her from conservative voters and compromise her chances in future state elections. The Houston gathering was the first women’s political convention since Seneca Falls in 1848. More than 1,500 women attended the Houston convention on Feb. 8-11, 1973. There were multiple group meetings within the Caucus during the three-day convention. Union women met, Puerto Rican women met, Mexican American women met, African American women met. Differences surfaced in the course of the conference as various groups, from the Republicans to minorities, fought to ensure that they had board representation and champions for their issues. For example, the Republican women, Northcott observed, failed to be recognized as a minority caucus within the NWPC. The convention agreed, however, that no more than 50 percent of the members of the Caucus’s National Policy Council would come from one political party. The convention ran out of time before it could pass resolutions. The debates at the convention, and later during Farenthold’s tenure, spoke to the challenges of creating what 1972 presidential candidate Shirley Chisholm called “a big umbrella organization” for women. As the organization’s first chair, Farenthold had to create a self-sustaining organization, while also pursuing the Caucus’s key goals: passage of the ERA and the election of female candidates. The Caucus professionalized its structure and became a political force under Farenthold. Male candidates for office sought the group’s support, and the Caucus succeeded in getting more women in elective and appointive offices. A brochure for the Caucus produced during Farenthold’s tenure cited several achievements: passage of the ERA in 30 states, five new women elected to Congress, and 28 percent more women elected to state legislatures in 1972. During her time with the NWPC, Farenthold fiercely defended the reproductive rights of women. 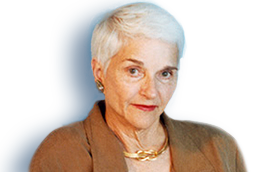 In the 1980s, she also served on the national advisory committee of the National Abortion Rights Action League (NARAL) as well as the advisory board of the Texas Abortion Rights Action League (TARAL).